You’ve dreamed about your fairy tale wedding, so why not have an actual Fairy Tale Wedding in the woods? 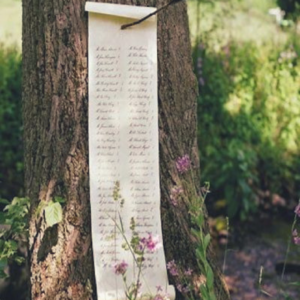 A Woodland wedding encompasses all the enchanted details of a magical fairy tale for your big day. 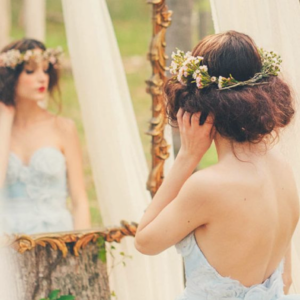 It’s definitely a look many brides are trying to replicate this year. If you are trying to recreate your favorite fairy tale, fantasy novel or Shakespeare play, the forest will be a perfect setting for your big day. 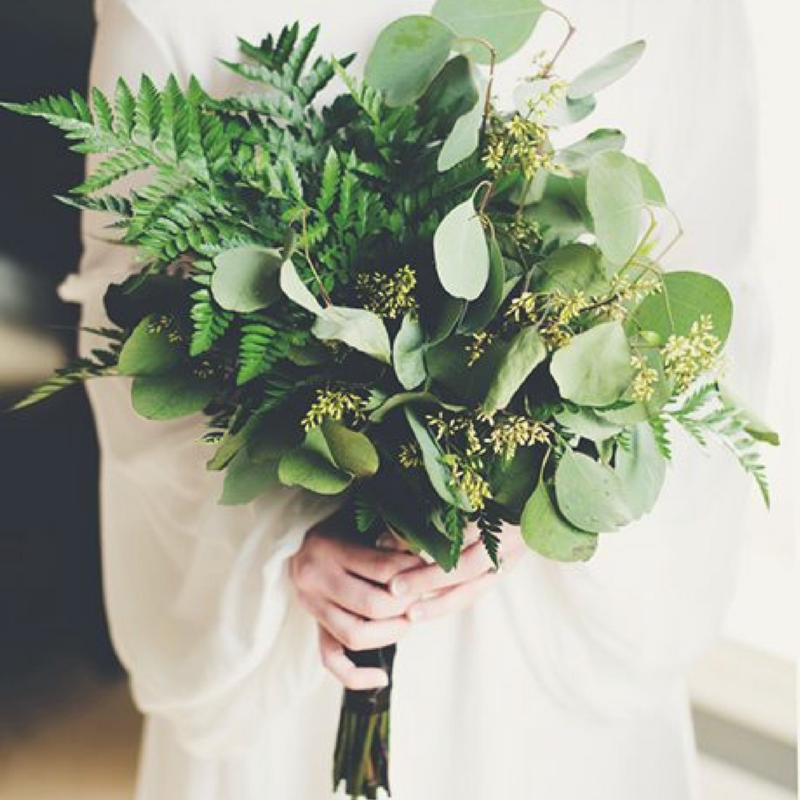 Think green for your woodland wedding when designing bouquets and boutonnières, table décor, and other floral accents. If you choose a wooded, outdoor setting, chances are good there’s plenty of greenery around to inspire you. In fact ferns, pine or fir boughs and moss are probably already in place. Consider a bouquet of native plants and keep your colors neutral. 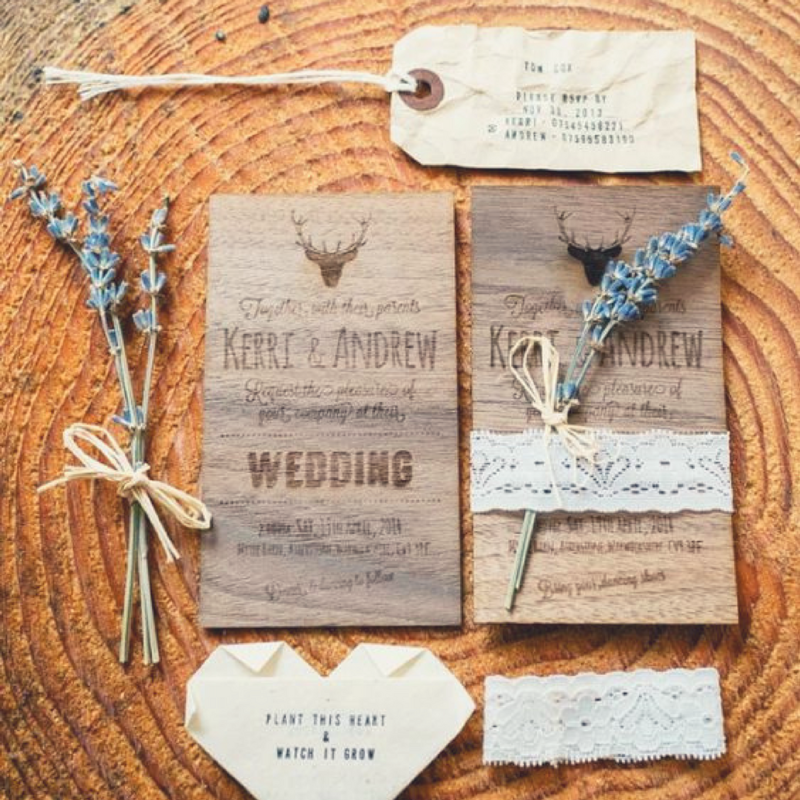 Wood details make your woodland wedding extra special. Use what you have in your outdoor setting like logs, tree branches and twigs, to create one-of-a-kind décor. There is a whole swath of Pinterest dedicated exclusively to things you can do with cut logs (read more about that here!) Don’t forget other wood elements such as signs, guest books, centerpieces and even gorgeous wood wedding announcements. No need to find a magic mirror, but you can give off the same vibe with mirrors in gorgeous gilt frames as part of your decor. Scour your local thrift stores or pick up a less expensive mirror on sale and apply some metallic paint to the frame. Empty frames make fantastic props for the photo booth and let all of your guests put themselves in the fairy tale. Clever signs can point the way Narnia, The Shire and Diagon Alley OR to the dance floor, the dining area, the cocktails and the ceremony. Signs are also a great way to let guests know your menu. 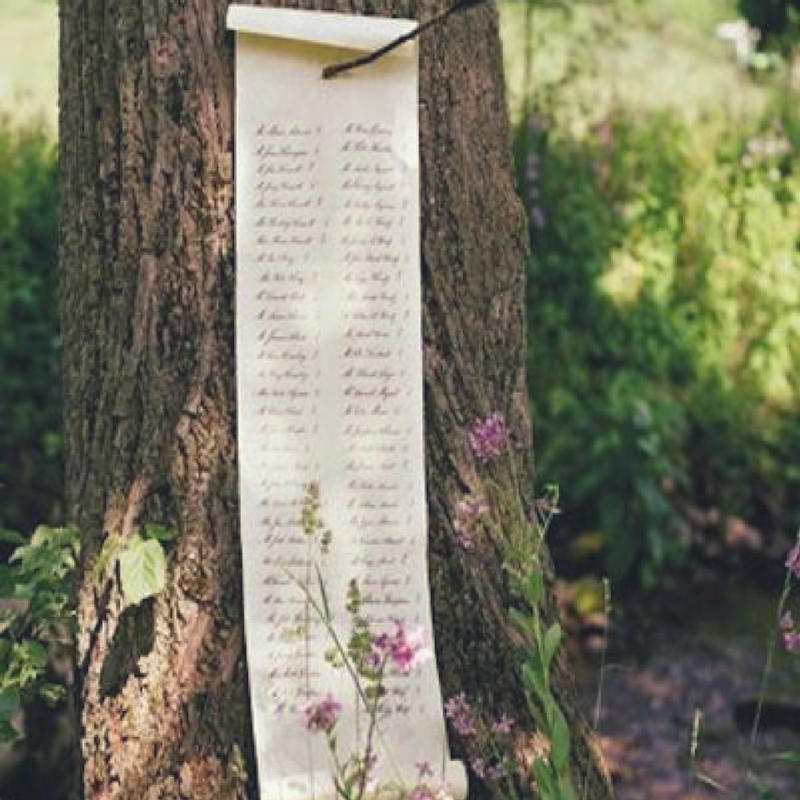 Post your menu “scroll” à la Sherwood Forest, stuck with an arrow to a tree. Create a magical ambiance by stringing fairy lights from tree to tree for an evening celebration. You can achieve an equally enchanting look with lights in the daytime. 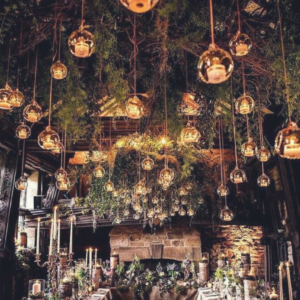 If your celebration space is heavily wooded with natural light filtered through the trees, strings of lights may still give off a soft, romantic glow. Naked cakes are simple, yet sophisticated and fit seamlessly into the natural, outdoor setting of a woodland themed wedding. 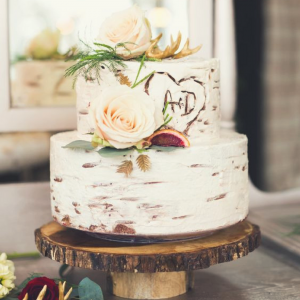 If you want just a little more sweet to go with your cake, try a gorgeous birch bark look-alike cake with your and your partner’s initials “carved” right into it. 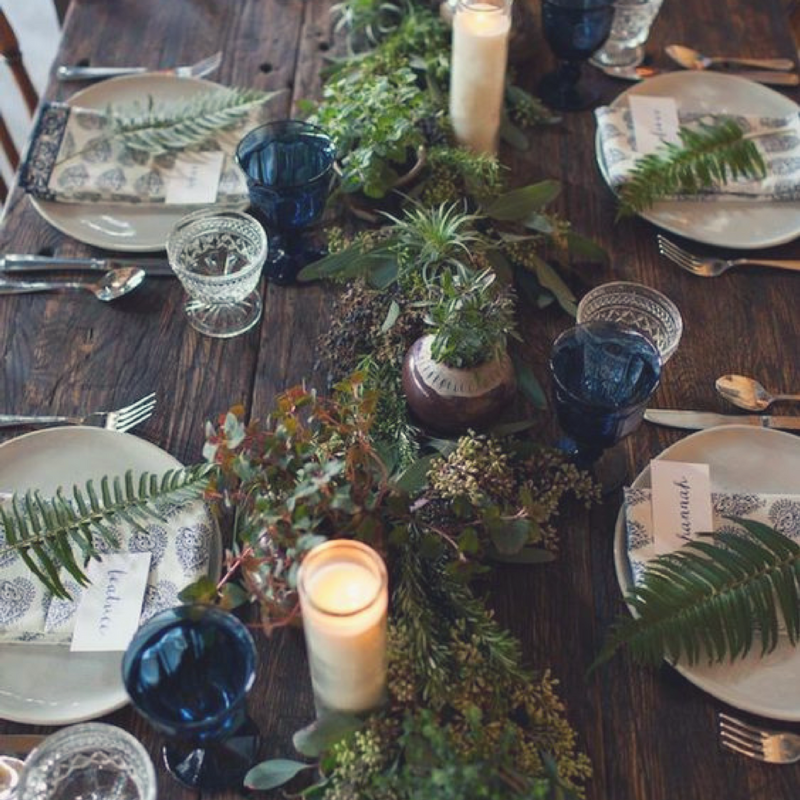 Let the forest be your muse when considering wedding décor. When you pick the woods as your venue, it’s already been decorated by Mother Nature. Twigs, moss, birds’ nests and pinecones bring a wild look that blends in seamlessly with the surroundings and will put everyone in the mood to be enchanted.